Grill a whole eggplant for about 20 or 25 minutes. 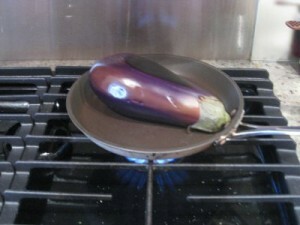 I use a heavy non stick pan, turn the stove on medium-high, and grill the eggplant turning it 90 degrees every 6 or 5 minutes until each side is roasted and the interior is soft. 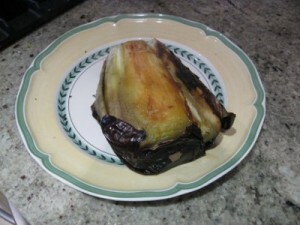 Then place the eggplant on a plate and peal it. The skin should come off relatively easy. Discard the skin and the stem. Cut the eggplant and let it cool. Do not discard the liquid released by the eggplant. I usually discard the seeds with the help of a spoon. Chop finely the garlic and the parsley. 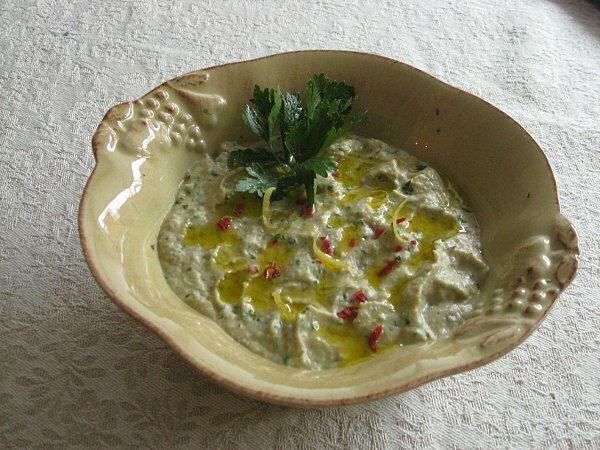 Use an immersion blender to blend the eggplant, salt, parsley, garlic, tahini, and lemon juice.Blend until you obtain a cream. Adjust salt and lemon juice to taste. Put the eggplant cream in a bowl, and garnish with some extra virgin olive oil and thin slices of fresh red chili pepper. Looks so delicious. This has to be a must try when my eggplant are ready in the garden.